Katie was eating cold ravioli from a can when her dad emerged from the radio room. His expression was controlled, but something about his stance told Katie that he was preparing for something mentally. Lindsay saw it too when she looked up from the book she was reading, a dog-eared SciFi paperback from the supply room called Icarus. Licking her lips and dropping her spoon into the half-finished can, Katie regarded him carefully. He pulled ten fully loaded magazines and started loading them into a bullet-proof vest before slinging it over his shoulders. With his vest strapped on and his SCAR secured, he went into the supply room and began shoving supplies into a scramble pack. She got up and followed him in, lingering in the doorway with a frown. He hefted the pack onto this shoulders and grinned at her. He didn’t say anything but moved past her back into the main room and knelt in front of Lindsay. She had the book folded over her thumb, keeping her page and just stared at him, unsure what to do. He held out a slip of paper to her. Lindsay reached out and took the paper hesitantly. She nodded to him just once before he reached out, squeezed her shoulder and then stood. Turning to Katie, he took her aside and led her from sleeping rooms and into the living quarters. His face softened and he frowned, gripping both her shoulders with his large hands. When she was little, she used to hold those hands as they walked through the woods. Her small fingers would be completely enveloped by his. They were rough, worn and strong, yet always holding hers so gently she barely felt them at all. In the two years since the divorce, she’d only ever felt comfort here, with him. Her mother expected things she couldn’t give and couldn’t be. Her dad just wanted her to smile. And to shoot straight, of course. Words were never his strong point. They spoke in other ways, with a language written in trips into the mountains and the beauty of a winter morning in the forest. “I’m sorry, Katie-girl,” he whispered and hugged her tightly. She returned the hug, the suspicions of his lies forgotten for now. She wanted to feel safe again and right then, she did. Don’t ever leave me again, she thought but could not bring herself to say it aloud. Finally, he sighed and stepped back. She did, but only barely. They’d gone there for one of her birthdays when she was convinced she was going to be a famous radio personality. She’d gotten to sit in the torn leather seat Johnny T sat in when he was doing his show. She’d been very excited. And also ten years old. She paled. Two weeks? He could be gone two weeks? What was she supposed to do for that long? Suddenly the bunker felt very claustrophobic. The air smelled musty and damp. She felt cold and it seemed too dark inside. Her breathing started becoming more rapid as panic threatened. A sudden, constant pulsing echoed through the ground and into the bunker. It was a steady, rapid wap-wap-wap. The helicopter. “Dad…” she began, but found that her panic had turned to sharp fear. “Dad, don’t… just…” She couldn’t say the rest. Don’t leave me. He must have read it in her face and drew her into another fierce embrace. She hugged him hard, her fingers digging into his shoulders. She whispered “don’t go” over and over. Suddenly she felt like she was five years old, grasping her dad’s leg and saying those same words before he left for deployment. She’d said them again years later, after the divorce papers ripped her away for 9 months out of the year. He was looking her in the eye now, his face deadly serious. Poveglia, she thought and committed it to memory even though she didn’t know what it meant. It only scared her more. It felt like he was saying goodbye. She nodded. “Yesterday,” she sighed and wiped the tears from her eyes, then nodded. “Remember, get to the radio station if the CB goes down,” he said and went for the door. Katie rushed to the monitors and saw that the helicopter was descending into the area west of the bunker. It was attracting attention too. Infected were converging on it from all angles. He pulled open the main door and turned to give her a wink. She was about to protest again when there was a series of flashes from the helicopter. Turning back to the monitor, she saw a large machine gun opening up on the infected. It was mounted to the side of the helicopter and operated by a soldier in full combat gear. There was one firing from the other side as well. Stunned, she didn’t even see her father leave and lock the door behind him. With her heart thumping hard in her chest and her stomach attempting to purge itself from anxiety, Katie watched her father run towards the helicopter. He raised his powerful rifle and several infected fell. The men in the helicopter continued to fire, the large machine guns tearing into the small horde that was converging on them. They closed in, running towards her dad on both sides. For a long, terrible moment, Katie didn’t think he was going to make it. She was looking around for her rifle, ready to run out and help, when she saw a bright flash go off into the middle of them. The bunker vibrated slightly and there was a quick, muffled thump. The monitor went white for a moment and Katie blinked her eyes in alarm. When it cleared again, the infected had turned on the source of the violent explosion of sound and light. Her dad’s path was now clear and he leapt into the helicopter as it began to pull away. It was out of sight in seconds, but the horde remained, seeking the disturbance in vain. She made mental note of that. Lindsay appeared at her side, her eyes glued to the monitors as well. She reached out and took Katie’s hand, then turned to look at her. Katie could see real fear in her friend’s eyes, but something else too. Trust. Lindsay trusted her to get them through this. 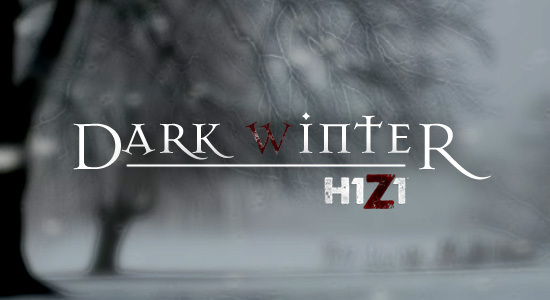 This entry was posted in Dark Winter, Fan Fiction and tagged Dark Winter, Fan Fiction, H1Z1, SOE, Zombie Apocalypse. Bookmark the permalink. Still really enjoying the story :D! Keep it up; it is super intense. Thanks, Will! Shall do my best. No problem 🙂 Sorry for the brain hemorrhaging lol. If you want, I can delete your comment but its perfectly fine to keep it. In case you’re wondering, the reason Katie and her father use .22LR is a nod to another Zombie book I really love. I had to do more research than I ever thought I’d have to do for guns to make sure an AR-15 would fire such a thing. I’m sure Homeland Security is looking into me now.